Ahh, the No. 10 pick, such a good place to run away from. What do the Bucks do with this pick? Trade it, I say, though it has limited value. Draft Klay Thompson or Marshon Brooks, others say — at least they can shoot, and the Bucks need a shooter. Draft Alec Burks others say, and pretend that he’s D-Wade or Sidney Moncrief in the making, which is what some are saying over at Brewhoop right about now, in fact. Trade the pick, I say, get a veteran or two who knows how to win an NBA game. 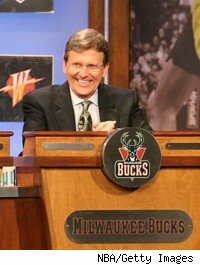 Yet, at 3 AM on the eve of the draft, the Bucks yet hold the No. 10 pick, so it’s witching hour for Bucks fans. Everything is true, everything is false, and everything is permissible. A month ago, I said the pick should be Marshon Brooks, the leading scorer in the Big East who happens to have a 7-foot wingspan at six-foot-four. He can shoot, he’s a great athlete, he led the toughest defensive league in scoring whilst hogging the ball on Big East cellar-dweller Providence. The Bucks backcourt was so bad last season that they probably should draft a guard, and draft the best guard available. That’s Brooks at No. 10 because the three guards better than Brooks (Irving, Knight and Walker) will be gone. But the Bucks would improve quicker and with more alacrity if they use the pick to dump the junk on their roster and try to bring in an NBA player (not a college kid) to back up John Salmons. (This latter “draft a backup shooter” proposition didn’t sound very good from the start, and John Hammond on Thursday traded his way out of it). This is probably one of the worst draft blogs you’ve ever read. I’m not sorry about that. Really, and I’m too disinterested to even post some sort of graphic. Well, that disinterest didn’t last long, did it? NOTE: The pick is gone, traded to Sacramento in a 3-team deal that sent Corey Maggette and Sacramento’s No. 7 pick to Michael Jordan’s rebuilding Hornets team (which now has the No. 7 and No. 9 picks). John Salmons returns to Sacramento, where he became an 18-points per game scorer (in 2008), to the Kings team that signed him in free agency from Philly. 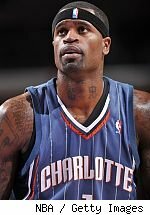 The Bucks get Charlotte shooting guard Stephen Jackson, reserve Shaun Livingston and the Bobcats No. 19 pick. From the Kings, the Bucks receive tall lefty point guard Benoh Udrih. This entry was posted in The Jinx and tagged 2011 NBA Draft, Alec Burks, Klay Thompson, Marshon Brooks, Sidney Moncrief on June 23, 2011 by J.D. Mo.